The “Strengthen Me Series” was born out of a series of Revival meetings, but they go MUCH deeper than that – it is personal – something that was personally needed, a reminder to me that others are in need of encouragement a whole scale above my own need. With the introduction of this series, the very first verse and the first photo are the one in preview on this page, a person was placed upon my heart and mind who I would find out later needed a tap on the heart. 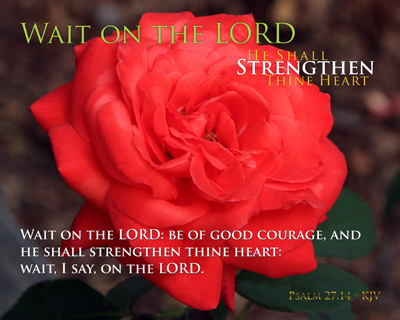 It is my hope that these prints will be ones that will be “delivered” right on time for each of us, reminding us that we must “Wait on the LORD” because “He Shall Strengthen Thine Heart” just when we need it!